The Capella Pedregal Residences is the newest fractional project in the exclusive Pedregal area  a 360 acre gated community -- near the resort village of Cabo San Lucas, Mexico. 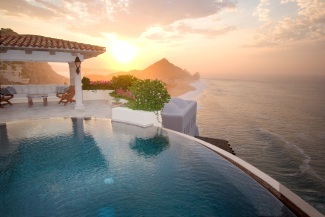 The residences will be associated with the ultra elite Capella Pedregal Resort and Spa, to be completed and launched in Spring 2008. There are many firsts with this development. Capella will be the only luxury hotel and residence resort with proximity to the Cabo Marina, and accessed through an unusual entrance -- a private tunnel carved through the mountain that separates the town of Cabo San Lucas from the Pacific, to be used only by members, owners and resort guests of the Capella Pedregal. Also, along with the membership in this Capella Pedregal Residence Club is a membership in the Capella Yacht Club, an innovation in the fractional interest field. For those who purchase an 1/8 fractional ownership in a residence, they can also have access to the fleet of Viking Sportfishers -- each vessel has three staterooms, three baths, a kitchen, Living rooms, dining room and the latest equipment and technology. The only fee for club members in residence will be the fuel and the provision costs. For those who wish to purchase wholly owned villas, there will be twenty Casonas available as well, priced from $2.0  2.5 Million. 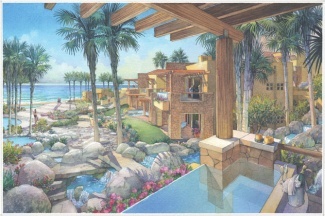 Conceptualized by Horst Schulze, former COO of the Ritz Carlton hotels, and operationalized by Jim Whitteron, President of Spring Creek Partners, an originator of the fractional interest /residence club industry, and Juan Diaz-Rivera, Development Principal, whose family owned and lived in the areas for years, the Capella Pedregal Resort and Spa will encompass 24 mountainside and oceanfront acres at Land's End  a famed rock configuration, where the Pacific Ocean meets the Sea of Cortez. The 31 Capella fractional residences will be clustered near the hotel, and will between 3,000-4,000 square feet of interior living space. There will be fourteen 3 bedroom and seventeen 4 bedroom villas, all with private plunge pools, outdoor fireplaces and firepits. In addition, there will be a private spanish-speaking concierge/ cook for each member, who will shop in the local markets, making Mexican specialties each day, if desired. For the 1/8 fractional interest, the owner receives between five and ten weeks a year, and unlimited space available. Those who don't use all their planned vacation have the option of entering into a rental program, where revenue can be shared by the owner and the Resort. As of this writing, fractional prices range from $515,000 to $595,000 for the 1/8 share. Pre-selling has already begun. For other private residence clubs and destination clubs with homes in the area please see the Mexico fractional vacation homes listings.